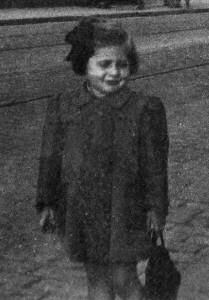 Further to my post on Vera’s Story, this is Vera in 1945, a child survivor of the Holocaust, including internment in Terezin. Congratulations to all involved in the opening of the new Holocaust Centre of New Zealand in Wellington last night. The beautiful room at 80 Webb Street features as the special opening exhibit the story of the Deckston children who were brought to New Zealand from Poland by Annie and Max Deckston. 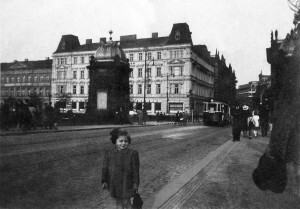 Few of their families in Poland survived the Holocaust. Among the exhibits the story of Clare Galambos Winter is represented, along with those of other Holocaust survivors. Especially moving is a display of buttons collected by the children of Moriah School in Wellington, each button representing one of 1.5 million children who died in the Holocaust. In his welcome, David Zwartz, Chairman of the Wellington Regional Jewish Community, paid particular tribute to Centre’s tireless Director, Inge Woolf. Inge in her turn said that she had led what must be ‘the best committee in New Zealand’. Their intention is that the Centre will never be finished but will grow and change as new material comes to hand. I thank David for allowing me to publish his full address below. Thank you for giving me the honour of speaking this evening. I would particularly like to acknowledge the survivors among us and the Ambassadors of Israel and Germany. On 27 January many of us here today met at the Kaori Cemetery and in the Grand Hall of Parliament to mark the UN’s international Memorial Day for the victims of the Holocaust, the genocide that resulted in the annihilation of 6 million European Jews, 2 million Gypsies 15,000 gay people and millions of others by the Nazi regime. 27 January was the day Auschwitz was liberated. Today, Yom HaShoah is a day of remembrance of the Jewish victims and resisters of the Holocaust. It is right that there is a special day to remember the Jewish people affected by the Holocaust. Yom HaShoah was originally set down to be on April 19th the day of the start of the Warsaw Ghetto uprising nearly 70 years ago. Yom HaShoah remembers the holocaust but also the resistance of the Jewish people. In Israel it has since 1953 been observed as Israel’s national day of commemoration for the approximately six million Jews who perished in the Holocaust as a result of the actions carried out by Nazi Germany and its agents, and for the Jewish resistance in that period. As a New Zealander I like the juxtaposition of Yom HaShoah and ANZAC Day on 25th April because ANZAC Day is the day New Zealanders and Australians remember their own resistance to Hitler. The New Zealanders who fought against Hitler and his allies were told by their Government that they were fighting for freedom and they believed it. Few of them would have understood the extent of the terror in Europe which the Jewish people faced. It is right that New Zealanders should remember how the world allowed the dignity and rights of the Jewish people to be stripped bare. It appropriate that we should do that so close to the day in which we remember the sacrifice that our forebears made for freedom and for human dignity and rights. If we are to stop anything like the Holocaust happening again we need Braver Kinder Stronger Smarter people in the world. Every one of us can be Braver Kinder Stronger and Smarter. How economic development and respect for economic, social and cultural, political and civil rights are important to removing the constituency of those who would divide us. We must remember that men who are too certain that they are right are always the enemy of liberty and freedom. Braver – because we will stand up for our rights and the rights of others. Kinder – because we will respect the human dignity of every other human being. Stronger – because we will be surer of ourselves and have greater resilience when the inevitable challenges come. Smarter – because we do remember what happened and also because brave kind and strong people are smarter. Bravery, Kindness, Strength and Smartness are for everyone not the so called intelligent. My time in Special Olympics has made me very conscious of the power of cognitive diversity. I have seen people with intellectual disability hold their own in a Boardroom they shared with some of the world’s greatest business leaders. The Nazis killed disabled people – the first disabled person killed was killed by Hitler’s personal order after a request from the disabled person’s parents! Modern Germany’s Basic Law is a sign of a lesson learned by a nation but the hearts and minds of the young Germans that I taught at law school here in Wellington are a better sign. Those young Germans understood the importance of human rights law but they also knew enough of what happened to understand their personal responsibilities. We must ensure that all New Zealanders accept their personal responsibility – laws are not enough. “(1) Human dignity shall be inviolable. To respect and protect it shall be the duty of all state authority. I would feel safer in this world if more people understood that while the State has a duty in international law to respect and protect human dignity the real people who can do that are you and I and all of us in our daily lives. The key to that is to remember. On January 1st 70 years ago the Declaration of the United Nations was proclaimed. In that declaration New Zealand with 25 other countries declared the commitment to the principles of the Atlantic Charter. Each Government pledged itself to employ its full resources, military or economic, against Hitler and his allies. Each Government pledged itself to cooperate with the other Governments that signed the Declaration and not to make a separate armistice or peace with Hitler or his allies. 70 years ago in July 1942 New Zealand’s commitment to the war reached its zenith with 154,549 men and women under arms. 70 years ago in North Africa young New Zealanders led the way in the battles that defeated the Afrika Corps. So valuable were they that Churchill did a deal with the New Zealand and US governments and 70 years ago in July US Marines arrived in Wellington and the US Army in Auckland so the New Zealand troops would remain in Africa and Europe. Most darkly though 70 years ago after about one million Jews had been killed the plans to eradicate the entire Jewish population were made. The extermination camps were built and industrialized mass slaughter of Jewish people began in earnest. This decision to systematically kill the Jews of Europe was made in Berlin on January 20, 1942. In Germany and Poland by the end of the war over 90% of the Jewish people who had lived in Germany and Poland at the start of the war were dead. Next year we will remember the 70th anniversary of the uprising in Warsaw. It began when the majority within a society acquiesced in acts of discrimination against minorities that were unpopular and vulnerable. The poison so released continued when that discrimination was institutionalized, and the state began to sanction hate against that minority and suppressed opposing views. The poison spread when those with responsibility in society closed their eyes to what was happening. This is particularly the case with professionals to whom society looks for truth and integrity. As Nuremberg shows us judges, lawyers, doctors and scientists became to a greater or lesser degree accomplices in a regime that treated minority groups as objects and was prepared to use brutality and torture and, in the end, extermination to achieve its aims. We must remember the Holocaust. We must remember why it happened. We must remember those who fought for freedom, for their own liberty and the liberty of others. These are false hopes; believe me, these are false hopes. Liberty lies in the hearts of men and women; when it dies there, no constitution, no law, no court can save it; no constitution, no law, no court can even do much to help it. While it lies there, it needs no constitution, no law, no court to save it. And what is this liberty which must lie in the hearts of men and women? It is not the ruthless, the unbridled will; it is not freedom to do as one likes. That is the denial of liberty, and leads straight to its overthrow. A society in which men recognize no check upon their freedom soon becomes a society where freedom is the possession of only a savage few – as we have learned to our sorrow. Never forget the Holocaust when the savage few were allowed a free hand by the many that enabled the savagery. Be so grateful that there are places like this to help us remember. Remember to be Braver Kinder Stronger and Smarter and to help others to be so as well. Remember too that we are in the easiest part of remembering because the survivors still walk amongst us. We have remembered for 70 years but we should not be complacent. It will be at least 100 more years before we know if the memory has stuck. We must dedicate our lives to making sure that people remember. If we do not do this it will happen again.